This column was first published on The 74 on February 13, 2018. This column first appeared in Education Next on January 17, 2018. What if every student actually could have an excellent teacher? According to a new study released through the CALDER Center, it might be possible. Study authors Ben Backes of American Institutes for Research (AIR) and Michael Hansen of the Brookings Institution found that students in classrooms of team teachers led by Opportunity Culture “multi-classroom leaders” showed sizeable, statistically significant academic gains. There’s interesting fine print, so read on. This column first appeared on Education Next. Great teachers matter—we all know that. But great principals matter nearly as much. We recently profiled three principals who achieved strong student learning growth in their schools in tough circumstances. Forming and leading a team of teacher-leaders proved crucial to all. But then what? Can great principals take their leadership to the next level and stay connected to teachers and students? Could they reach all schools, not just the fraction they reach today? We asked just that, and here’s our answer: yes. In An Excellent Principal for Every School: Transforming Schools into Leadership Machines, we share our vision for how districts and charter networks can reach a lot more students and teachers—potentially all—with great principals, for much higher pay, within regular budgets. You might recognize this concept, since we’ve floated—and implemented—similar ideas with teachers in Opportunity Culture schools in several states already (including unionized districts). We’ve now extended our thinking to principals. These are the right words, but our nation’s teachers and students need far more than words. Reports are a start. We’ve written quite a few of them ourselves about the need for new school designs that extend excellent teachers’ reach, going back to our 2009 3X for All. TNTP itself called for extending the reach of great teachers in one of its prior reports, The Irreplaceables. Teach Plus, Education Resource Strategies, the National Network of State Teachers of the Year, and others have, too. What if all of us, and more, turned talk into action? What if the opportunity of new school designs and teacher roles were available to teachers everywhere? This post first appeared in Education Next. Maybe it’s because we’re turning 50 in the coming year and have together been pondering the plight of the poor and their lost human potential since we were 20. But we’re weary of hearing education reformers pretend that just changing policies and management systems—name your favorite—will put an excellent teacher in every classroom. Even though most of us have spilled voluminous ink on those topics. What if, instead, change started where excellence already lives—in the classrooms and minds of excellent teachers? That is, those teachers who achieve large student learning gains and leaps in higher-order thinking, and who inspire and motivate students and colleagues alike. What if all it took to launch were a handful of willing superintendents and some committed principals? Ones willing to empower those excellent teachers: to reach far more students, lead and develop teams of colleagues on-the-job, and help their principals lead their schools, for substantially more pay? What if all “systems” changes were geared to make that possible, at large scale? From that line of thinking was born Opportunity Culture, an initiative to try this idea: Let school teams with teachers on them redesign jobs and use age-appropriate technology to extend the reach of excellent teachers and their teams to many more students, for more pay, within regular budgets, adding more planning time, and having them take full accountability for the learning of all the students they serve. Seven schools in two states began implementing these new school models in 2013–14. More than 30 schools in three states implemented last year, and more than 60 schools in five states will be implementing or designing their school models in 2015–16. The Public Impact team facilitated school decision-making, along with Education First and Education Resource Strategies, and we produced many free materials to help. But the teachers and principals get all the credit for their outcomes. We’ve gathered data on their early results from the first two years, and we report all the data for which comparison groups were possible. These outcomes are promising for students and teachers, but there is room to improve the support—and, yes, the systems and policies—that affect teachers in these new roles and their principals. For several years, we’ve been asking teachers and districts to imagine: Imagine schools and a profession where all teachers can improve their teaching, be rewarded for getting better, and reach more students with excellent instruction—by creating an Opportunity Culture for teachers and students. Districts are responding: As of spring 2014, four districts nationally are piloting Opportunity Culture models, and one, Charlotte-Mecklenburg, is taking its pilot efforts to scale based on recruiting results and demand from schools. But what if a whole state reimagined the teaching profession and pursued an Opportunity Culture for all? What benefits might accrue for students, teachers and the state as a whole? Using North Carolina as an example for analysis, Public Impact ran the numbers—and the results weren’t small. 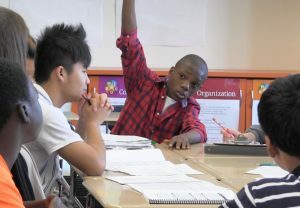 We have exciting news today, with potentially big implications for teachers and students: Charlotte-Mecklenburg Schools (CMS) announced a scale-up of its use of Opportunity Culture models that extend the reach of excellent teachers and their teams to more students, for more pay, within budget. The Belk Foundation, a local family foundation, announced a rare, three-year commitment to fund the redesign work, after which the models will be financially sustainable. For far too long, the field has relied on unsustainably funded career paths. “Sustainable” equaled “We’ll apply for another grant.” This has limited opportunities to districts with superior grant-writing abilities, not the many more with committed, capable leaders who truly want to help more children learn and more teachers excel. With sustainable models, CMS—and other districts that follow its lead—can make a long-term promise to current and prospective teachers, rather than snatching back extra pay, and the roles it funds, after a few years. Our team at Public Impact will partner with Education Resource Strategies to help schools select and adapt models that reallocate funds to pay teachers more for taking responsibility for more students’ learning, directly and by leading teaching teams in fully accountable leadership roles. Together, we will also help school teams, all of which include teachers, increase on-the-job planning and development time, and provide for flexible scheduling and grouping.